Kanye west sends private jet for Kim! Never fear, Kanye West is still so smitten with Kim Kardashian that he’s sent his very own private jet to Greece to whisk her away from her family and into his tender, loving arms. Well, something like that anyway. Just to recap, because L.A. is so lacking in state of the art recording studios (raised eyebrows) Kanye is having – and we mean HAVING – to record his album in Paris 5,600 miles away from where his pregnant girlfriend is contractually obliged to be. But it’s okay, because he’s doing nice things like sending his plane to collect her from nearby Greece. Pregnant Kim wrapped up filming Keeping Up With the Kardashians with her sisters Khloe and Kourtney , her nephew Mason and niece Penelope Disick, Scott Disick and her mother Kris Jenner, at the holiday resort. Kim and Kanye spent a few days together in New York City last week. A source told the website that while Kim ‘honours all of her work commitments she is in constant contact with Kanye at all times when they aren’t together.’ And remember Kanye just can’t be in a backwater like L.A. when it comes to making music, remember that. Kourtney Kardashian and Kris Jenner touch down in London! They are always at the forefront of trends and fashion. 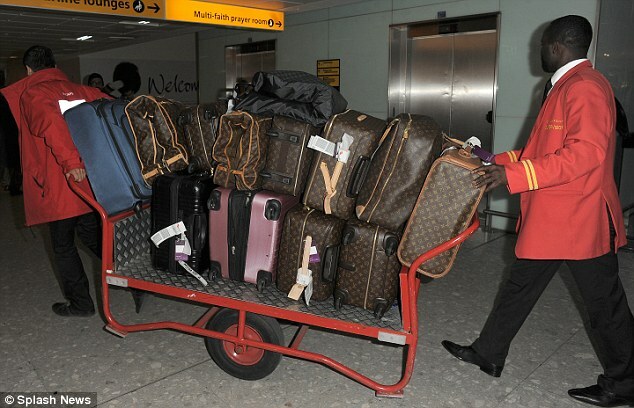 So when Kourtney Kardashian and her momager Kris Jenner travelled to London, it came as no surprise that they were armed with a mountain of luggage. As the pair touched down at Heathrow Airport on Wednesday morning, they were followed by a trolley containing 11 large suitcases and suit bags – to ensure they had enough outfit options for their stay. Clearly having planned her ensemble carefully, Kourtney looked chic in a black and white chequered coat as she exited the airport, pushing her daughter Penelope in her pram and holding onto her son Mason. Kris, meanwhile, wore an odd ensemble consisting of a heavily patterned black and white trouser suit and a white shirt. Opting for comfort over style for the long-haul flight, Kris topped off her outfit with a pair of flat loafers. Little Mason, meanwhile, looked ready for bed following the flight in a blue all-in-one, teamed with a pair of black biker boots. Kourtney was joined by her boyfriend Scott Disick for the trip, as the newly-crowned ‘Lord’ is due to attend various social commitments while in the English capital. 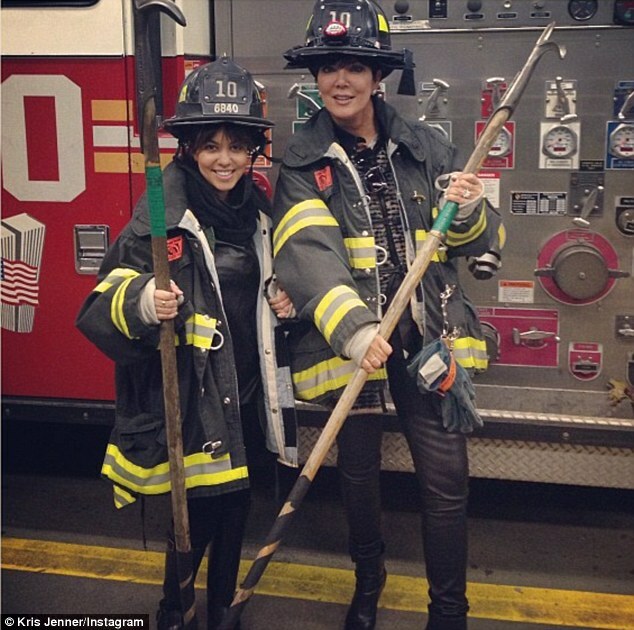 On Tuesday, Kourtney and Kris slipped on firefighter outfits while visiting a local station in Manhattan. The 57-year-old matriarch and the 34-year-old socialite skipped the massive hose in favour of brandishing pike poles for the tourist snap, which they posted on Instagram. 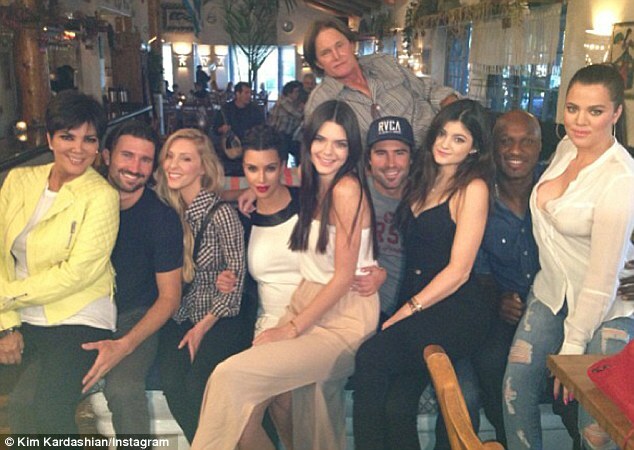 ‘It was an honor to visit everyone at Fire House 10 thanks guys!’ the momager tweeted to her 2.9 million followers. Firehouse 10 is located across the street from the World Trade Center site and the 9/11 Memorial. A total of 343 firefighters and paramedics were killed in the devastating 2001 terrorist attack. Earlier on Tuesday, the reality stars were seen leaving their Manhattan hotel alongside Kourtney’s partner Scott Disick and their son Mason. The mother-daughter duo rocked matching Hermes Birkin bags, which cost around $15,000. Kourtney wore a green Army jacket over a black leather top and skinny jeans tucked into riding boots. Kris followed close behind in a printed blouse, black leather trousers, and high-heeled booties. Sour-faced Scott and his sharp cheekbones carried little Mason while clad in a black top under a leather jacket and light-blue jeans. Kourtney Kardashian is Bang on Trend! She’s known for her classic, grownup style. But Kourtney Kardashian opted for a flashier, more playful look on Wednesday. The 33-year-old donned trousers with a matching sleeveless jacket that sported giant red-and-white flowers and wore her hair in a braid atop her head as she arrived at a studio in Hollywood. The reality star showed off her slender figure in the daring outfit, which she paired with black pointy heels and a low-cut black tank top. She wore her brown hair in a messy updo, with a braid wrapped around her head and her bangs framing her face. She further upped the glamour factor with bright red lipstick and highlighted her brown eyes with subtle black eyeliner. Her sister Kim was spotted arriving with her at the studio, showing off her pregnant belly in a skintight sea green dress. She paired the frock with matching suede green heels and wore her hair long and straight. Kourtney’s partner Scott Disick, meanwhile, says he doesn’t want to marry the reality star. The 30-year-old – who shares two children, Mason, three, and Penelope, nine months, with his girlfriend of more than six years – has revealed he no longer wants to tie the knot despite previously planning to propose to the brunette beauty on their show Keeping Up With The Kardashians and purchasing a diamond ring. He told Ryan Seacrest in a one-hour E! News Presentation special, airing on Sunday: ‘I think if it’s not broke, don’t fix it. You know what I mean? It was previously reported that Kourtney wants her sister Kim’s boyfriend Kanye West to design her wedding dress should she and Scott ever decide to wed.
She said: ‘I’m going to let Kanye design my wedding dress. 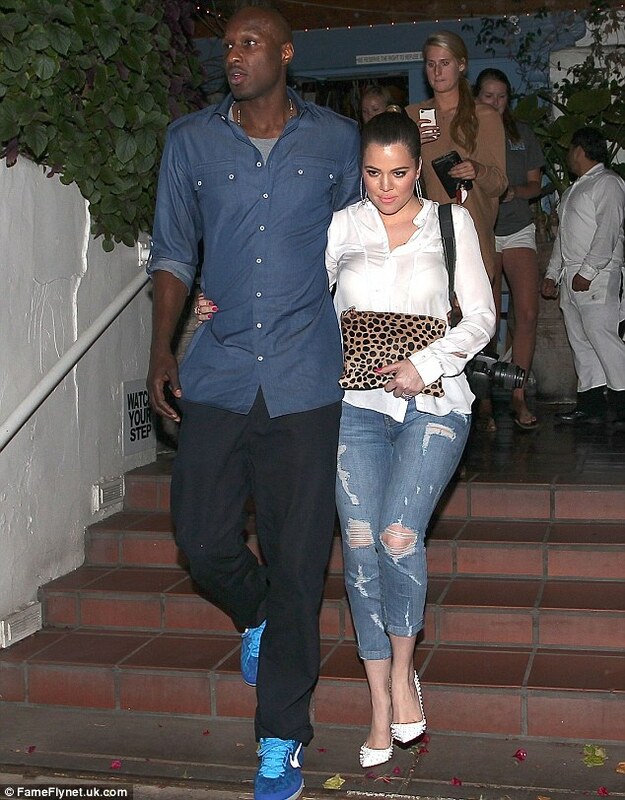 Just not right now!’ Kourtney recently offered to be a gestational carrier for her sister Khloe, 28, who has been struggling to get pregnant with her husband Lamar Odom for three years. Kourtney Kardashian’s post baby body seems to have bounced back in record time. But as the March 10th an episode of Kourtney & Kim Take Miami revealed , getting into biking ready shape after the july birth of her daughter Penelope was anything but easy for the 33 year old mother of two especially with boyfriend Scott Disick pressuring her to speed up the process. 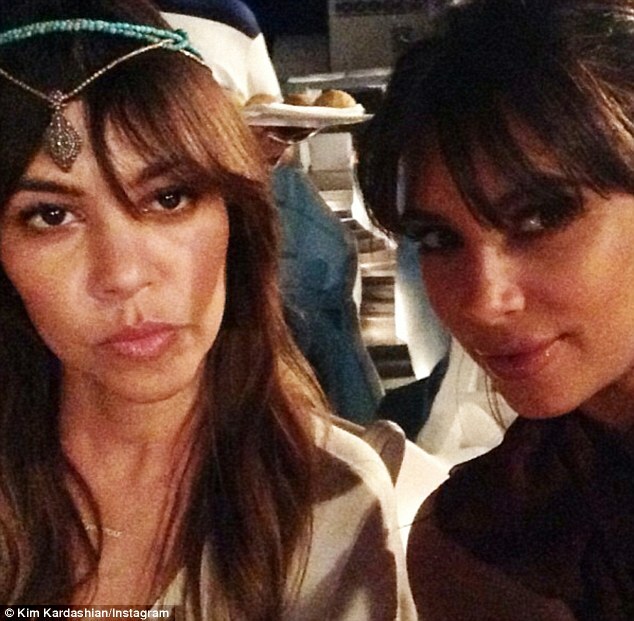 The drama started when Kourtney stepped onto the bathroom scale while chatting with Disick and sister Kim Kardashian. Upon seeing that his 5 foot tall girlfriend weighed 115 pounds. She’s shed 44lbs and slaved away at the gym since the birth of her daughter Penelope just seven months ago. And Kourtney Kardashian’s hard work has not gone unnoticed. her besotted boyfriend Scott Disick couldn’t keep his hands off the 33 year old as she sunned herself in a bikini in Mexico during a family vacation. As their three-year old Manson ran around at their feet. The couple shared a lingering embrace in the surf. she wore one simple black two piece with bead embellishment and a black and white agent provacatur Mazzy Binking which features around her slim hips. The couple were enjoying some time out together with their two children on the iddylic Mexican coastline.